The Leica R4 is the first compact SLR of the famous German camera manufacturer. Born from a joint venture between Leitz and Minolta, the Leica R4 is the first compact single-lens reflex camera of the German manufacturer after the huge and heavy Leicaflex, Leicaflex SL, Leicaflex SL2 and Leica R3. Its production started in 1980. Its performances aren't exceptionnal when compared to the competitors of its time (like the Olympus OM1) but it allows to use the legendary Leica R lenses (in their 3 cams version). Along with its perfect build, the main strength of this camera is its numerous exposure modes : aperture priority with central-weighted or spot metering with exposure lock, speed priority with central-weighted metering, program and manual. Its main weakness is the lack of TTL flash metering though the flash-sync speed is set automatically with dedicated flash units. The Leica R4 can be fitted out with a motor drive (allowing 2 or 4 shots per second depending on the motor) and optional viewing screens (5 screens available). It has a depth of field preview lever and a self-timer. 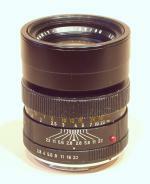 The focal plane shutter is made of vertically travelling metal blades. Shutter times range from 1/1000 s to 8 s in auto mode and from 1/1000 s to 1 s in manual mode. An emergency speed of 1/100 s can be used without batteries along wih the B pose. The manufacturing quality is top-level and the viewfinder, which covers 92% of the actual field of view, is very bright. The shutter release is particularly soft. The first Leica R4 had the reputation of being unreliable. The problem was solved from serial number 1 600 000 onwards. A used R4 can be bought without fear with this simple knowledge. The next model, the R5, introduced TTL flash metering. 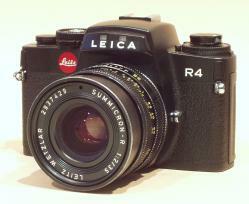 However, cheap for a Leica, the R4 makes the dream affordable. Though heavy, the Leica R4 is easy to use. Its numerous exposure modes allow to manage the most difficult lighting situations or to take point-and-shoot pictures in program mode. It is possible to switch between modes while looking in the crystal-clear viewefinder. Within each mode the actual speed and aperture are shown in the viewfinder. In manual mode the recommended speed is also shown by the LED display. The release button is soft as a dream and the shutter is quite silent for this type of camera. A little window shows the type of film loaded. The camera uses Minolta's correct film loading indicator. Leica made some ergonomics mistakes however : the exposure correction lever is too tiny and very unconvenient to use. It is almost impossible to rotate the speed selector while keeping the finger on the release button, thus shutting the light meter's indications off. 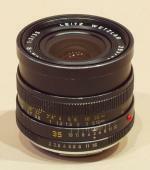 Concerning lenses, Leica has no lessons to take from anybody. They are simply perfect, razor sharp, contrasty, and of incredibly strong build. In spite of its little ergonomics problems, the Leica R4 is a very good choice for those wishing to enter the world of high quality photography. The sound of the shutter at 1/1000 s.